Whether you have a large group attending your church retreat or just a few members, we have cabins of all sizes to easily accommodate your group! At Large Cabin Rentals, our cabins range from 4 bedrooms to our massive 18 bedroom that is appropriately called the King of the Mountain! All cabins feature comfortable bedrooms where you can spread out and enjoy a wonderful night of rest among the fresh air of the Great Smoky Mountains! One of the highlights of any church retreat at Large Cabin Rentals is the time spent enjoying a meal together in your cabin’s lovely dining room! All of our cabins feature a fully equipped kitchen with a full-size refrigerator, stove, microwave and every other amenity necessary to prepare meals without a fuss. As you sit down for a delicious dinner, enjoy this unique time spent with your fellow church members! Our Pigeon Forge group cabins are packed with fun amenities for your group to enjoy throughout your church retreat to the Smokies! 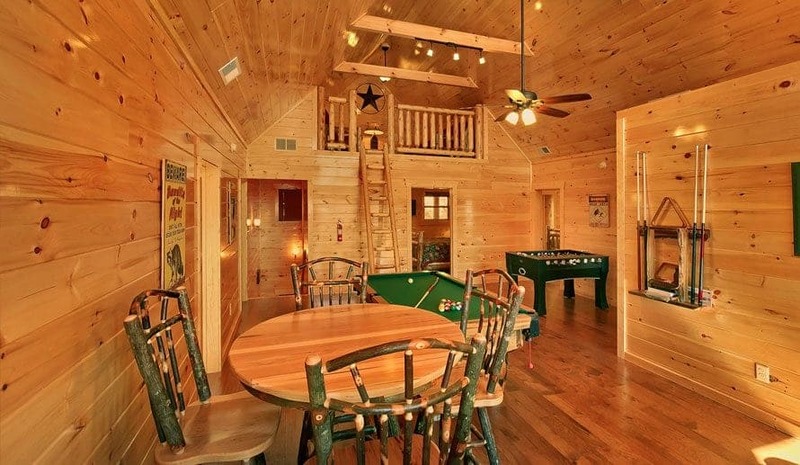 Many of our cabins offer outdoor hot tubs, a pool table, movie theater and many other exciting amenities. If you are looking for something truly extraordinary, we even have cabins that feature their own private miniature golf course or indoor swimming pool! After visiting Large Cabin Rentals for your church retreat, your members will be talking about this getaway for years to come! Our cabins are just minutes from all of the attractions of Pigeon Forge where you can enjoy fantastic shopping, dining and entertainment options. It can be fun to visit Dollywood as a group, and you can even take advantage of the Dollywood group rates for your church group if you have at least 15 people! Of course, our cabins are only a short drive from Great Smoky Mountains National Park where you can spend a day hiking the trails and enjoying the magnificent scenery! While spending a church retreat at Large Cabin Rentals, your group can take advantage of our seasonal outdoor pools! Spend an afternoon relaxing in the lounge chairs or cooling off in the refreshing waters of the pool. We also are pleased to offer a newly-renovated exercise facility where you can use a treadmill, weight machines and free weights, as well as our relaxing sauna and steam room! Check out all of our Pigeon Forge group cabins today to plan your next church retreat to the Great Smoky Mountains! We look forward to seeing your church group soon at Large Cabin Rentals!